Between their second and third birthdays, kids make distinct advancements in language development. Not only is vocabulary capacity constantly increasing, but two-year-olds become more adept at forming correct sentence structure and make grammatical improvements as they near their third birthdays. The first half of the third year sees kids with vocabularies of 200-300 spoken words, on average. Their capacity to understand other people is impressive, with about 500 words well writhing their level of understanding. Kids at this age will often speak in two to three word sentences, but their use of grammar and understanding of sentence structure is limited. They will typically refer to themselves as "me" in sentences, rather than "I." For example, "Me want ball." would be common for an early two-year-old child. Later in the year, two-year-olds begin to get a better grasp of grammar, allowing them to form mostly correct sentences. While a younger two-year-old may say, "Him took ball," a child who is a little closer to the third birthday would say, "He took my ball." By three, kids are also able to sustain full conversations, even making allowances for the person to whom they are addressing. For instance, three-year-olds will speak in simpler terms to a classmate, but can engage in more detailed conversations with a parent or teacher. As with younger kids, it is important for parents and carers to actively engage their two to three year old in conversation, allowing the child the opportunity to voice their opinions and be heard. Language development is closely associated with social development, so building children's confidence in their verbal abilities will help them to interact assertively with peers and others in their lives. When children make mistakes in their speech, parents and teachers should correct them without appearing harsh or judgmental. For example, if a child says, "I runned really fast!" a parent could respond with, "Yes, you ran very fast. I am so proud of you!" In this way, the child is subtly corrected without being made to feel foolish. 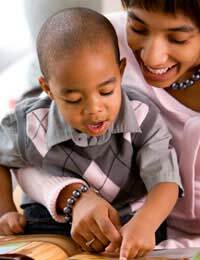 While each child's development follows its own timetable, parents should notice that their child continues to make progress with increasing vocabulary, improving sentence structure, and progressively correct grammar. While most differences in development are well within the range of normal, there are times when parents are right to be concerned. If a child's speaking capabilities seem to stall out or regress, parents should schedule a consultation with a speech-language pathologist to rule out any causes of worry. Speech delays are not necessarily worrisome, but should be evaluated. If speech therapy is needed, it is best to begin early, allowing the child the benefit of professional guidance before formal schooling begins.Stammering, for instance, may begin at about this age, but with early intervention, many children who stammer can be taught to slow their speech and control the stammer, contributing to both their language and social developments. More often than not, a speech evaluation will show that the child is doing fine, but when in doubt, it is better to seek the advice of a professional. Can Baby Sign Language Delay Speech Development? I have 5 children and with each child I learned handle the tantrums differently. @None - you're right. I always find that speaking to them eye-to-eye is always the best option.